EYMOUR, Tenn. — Shortly after school let out for the summer break, a group of Garrett County teens started their vacation by helping folks who needed it in Seymour, Tennessee. Les and Cricket McDaniel have been the youth leaders at Oakland Church of the Nazarene for several years and work on organizing activities for the teens. 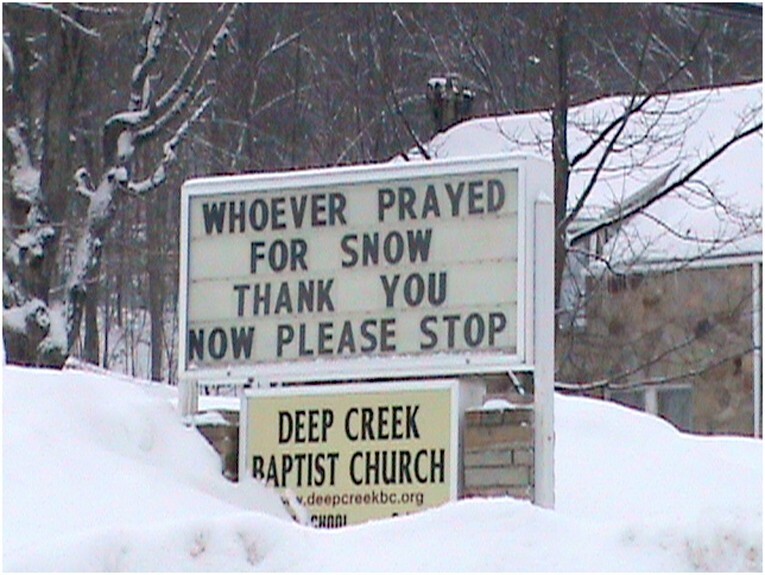 I saw this unique photo on the front page of the Republican website and thought it would be worthwhile to profile the Deep Creek Baptist Church. There are always small grains of truth and scripture on their billboard that will make you chuckle or think. Deep Creek Baptist Church is focused on pointing people toward Jesus Christ, the One and Only Son of God, as the only means of gaining eternal life in heaven. While Deep Creek Baptist Church is the oldest Baptist church in Western Maryland, tracing its origins back to 1775. It wasn’t until 1891 that it became a part of the Maryland Baptist Union Association. In 1879 and 1890 Reverend Frank Cunningham and Reverend W.P. Fortney, from the Jersey Baptist Church of Somerset County, Pennsylvania, came to the Friendsville/McHenry area and held a preaching mission in the local log schoolhouse. Converts and friendships were made. Seven years later the new pastor of the Jersey Baptist Church came to Deep Creek at the invitation of local residents to do some sport fishing. He was asked to hold meetings at the log school during his visit. Out of that double fishing trip (for fish and souls), the Deep Creek Baptist Church was organized on December 11, 1887, with Reverend Nathan Hart as pastor. Deep Creek is the oldest Baptist church in Garrett County. It has been instrumental in starting two other churches in the county. The first house of worship was erected in 1888 and lasted seventy years. The church closed in 1912, the same year that Reverend Clement W. Hudson left after serving as pastor for eight years. When Reverend Hudson returned in 1916 for a summer visit, he was dismayed and shaken to find the church boarded and closed. He entered through a semi-boarded window and wrote on the pulpit Bible, “O Lord, revive Thy work in the midst of the years”. The church reopened ten years after forty-eight hundred acres of glade land had been made into Maryland’s largest fresh water lake directly in front of the church in 1924. A rededication service was held in September 1934. Pews and a piano were bought from a black church in Frostburg for thirty dollars. No services were held again until 1935. On May 2, 1937, Reverend William B. Orndorff accepted a call to become the pastor of the Baptist circuit of Loch Lynn, Ferndale, and Deep Creek. The church has had a total of fourteen pastors, ten since its reopening. In 1958 the original building was dismantled and a new fieldstone building begun. The first service in the new and present church was held on June 4, 1961. A parsonage had been erected on the church site with its first occupant being Reverend Charles P. Anderson. A centennial weekend celebration was held on Labor Day weekend in 1987. Deep Creek Baptist Church is a community church with resort attendances three times larger in the summer. Our visitors are always welcomed and encouraged to come back and kick off your shoes to stay a while. The evening services from the end of May through Labor Day are held at the local state park. The church’s current pastor Dr. Ben J. Lahay grew up in Baltimore and as a young man came to vacation at the Lake with his family.